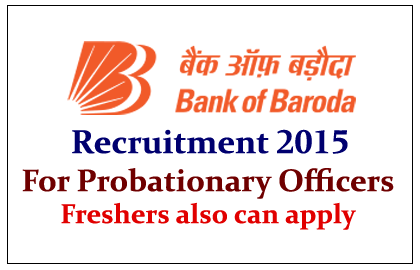 Bank of Baroda has announced the recruitment notification of the post of Probationary Officers (PO) 2015. Eligible candidates can apply for this post before 17.03.2015. Any Degree with 60% marks in recognized university. Candidates will be selected on the basis of the performance in the Online Examination, selected candidates will send to the Manipal School of Banking for 1 year PG Diploma and Finance Course, after that bank will recruit for the PO in Junior Management Grade Scale-I (JMG).